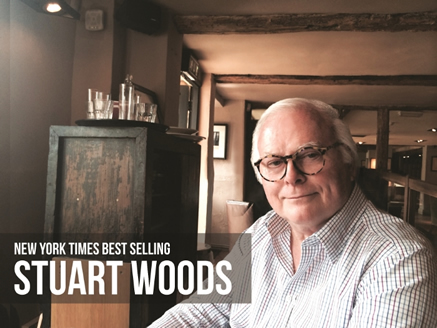 Interview with New York Times Best Seller author, Stuart Woods. Stuart is a native of Georgia and began his writing career in the advertising industry. Chiefs, his debut novel in 1981, won the Edgar Award. Stuart has had a long and prolific writing career having written some 60 books since first being published. He has had thirty-nine straight bestsellers on the New York Times hardcover list. To this day he continues to publish at a hectic pace with his publisher asking that he write three new books every year. An avid sailor and pilot, Woods lives in Florida, Maine, and New York. Your first book, Chiefs, was turned down by three publishers before being bought by Norton. It was later given the Edgar Award for ‘Best New Novel’ by Mystery Writers of America and turned into a TV Mini-series. Was there a point prior to Norton’s purchase of the publishing rights that you considered giving up on the book? Never. Against everyone’s advice I submitted the book with 100 pages and a synopsis. I believe that if I had finished the book before submitting it it would have sold quickly and for a lot more money than I got from Norton ($7500). You have said that you are now writing three novels a year. How long did it take you to write Chiefs? Eight years, but I wasn’t working every day, or even every year. It was a monumental case of first novel writer’s block. How has your approach to the writing process changed, if at all, over the years? I write much more improvisationally and more quickly. It used to take me four hours to write a chapter of five or six pages; now I do it in an hour. Confidence is a great thing. When asked whether you enjoy writing your novels as much as we enjoy reading them, you responded that ‘any way you slice it, it’s work’. Was there a time early in your career when this was not the case? No, it was much harder in the beginning. If you’re any good, you reach a point where you think that if you wrote it, it must be pretty good. You have said you knew you wanted to write at the age of ten. How old were you when you actually started writing fiction? You named your first boat and all your dogs ‘Fred’. Is there any significance to the name, or is it just one you like? I named my first boat after the dog, in the hope that it would like the water as much as he did. Can you identify a role that sailing played in your personal life that has influenced your writing? I got my first book out of sailing and my first publisher from that book. I’ve often used sailing in my novels. If you have a favorite among your characters, who would that be? What would his/her favorite word be? What would he/she like to say to you? Probably Will Lee, because he’s the most like me. If he has a favorite word, he’s never told me. I hope he would thank me for giving him such a good life. What advice would you give an aspiring novelist for success in the age of self-publishing and digital media? Write something. It’s amazing how many aspiring writers do that. I would add: finish it, then get an agent. Self publishing is something you do when everyone has rejected your work, but you think it’s fabulous. What are your thoughts on printed books vs. e-readers, and the advantages and disadvantages of each to authors? I think e-readers make lousy interior decoration. You can’t fill your bookcases with them. I like holding a book in my hand or in my lap and feeling the pages as I turn them. What is the most important single piece of advice you can give to a young person eager to venture into writing? Get a job that requires you to write a thousand words a day, whether you feel like it or not – newspaper, magazine, ad agency, etc. Being able to do that well is half the battle. I would finish my novel sooner and the second one, too. If I had done that I’d have had an eight-year head start on my career.